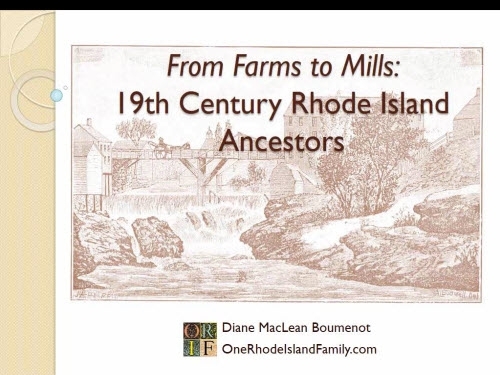 I enjoy reading your blog from time to time, as I have been researching my Rhode Island family for years now. Based on things your have written in other posts, I think we probably have a lot of ancestors in common, at least the early ones. My maternal grandparents were both descended from a healthy number of the early founders (Williams, Olney, Smith, Mowry, Whipple, Brown, both Arnold families, Hutchinson, Cole, Gardiner, Browning, Congdon, Potter, Greene, Capron,etc). I won’t go into all of them here. 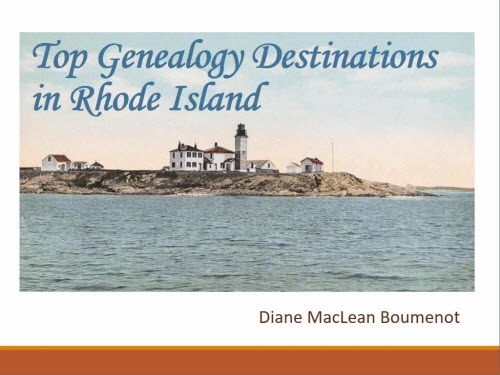 The reason that I am descended from so many prominent early settlers is that unlike many families that drifted away from RI, my grandfather’s and grandmother’s ancestors all stayed. Until his generation, my grandfather’s family were in the Providence/Smithfield/Glocester area of the state. My grandmother’s family were all from South County, except the earliest ancestors from Portsmouth and Newport. I might be able to answer one of the Phillips questions you have. The North Kingstown Phillips family that descends from Samuel is my grandmother’s family. It is not associated, as far as I know, with the Michael and Barbara Phillips family. Samuel, born c. 1656 in England, didn’t arrive in Rhode Island until fairly late. The exact date is not clear, but he was an adult when he arrived without his parents. There is some indication that he may have been in MA before. His wife Elizabeth appears to have been from Taunton. He doesn’t show up in Newport records until late, I think the 1680s. He seems to have prospered. in 1709 he bought land in North Kingstown, a short distance south of Wickford, the area that used to be called Belleville Station, less than a mile below Collation Corner and about a mile or two north of Allenton. I haven’t been to RI since the late ’80s, so I don’t know if these old place names are still current. The family was prosperous throughout the 18th and early 19th Centuries, but for the most part that prosperity was long gone by my great grandparents’ generation. I contacted the Phillips DNA project to tell them my Phillips ancestors were not related to the others. Since my Phillips family is on my maternal side, I can’t help out with the DNA project. In fact, to my knowledge they has only been one Phillips male to have a male child who lived into adulthood and procreated in the last four generations, although there could well be some from the fifth generation back. I actually think I do have a Michael and Barbara Phillips connection on my grandfather’s side, however. When Barbara Phillips married Edward Inman (another ancestor) after Michael had died, several of her male children and grandchildren seem to have removed to Smithfield. Inman was involved in a land deal with John Mowry, John Steere, and others that basically led to the founding of Smithfield. Barbara’s grandson David (Joseph’s son) appears to be a direct ancestor through Zebedee Phillips, a son of his first wife Ruth Benson, and Zebedee’s daughter Esther Phillips Young, wife of Othaniel Young, my grandfather’s 3rd great grandfather. David Phillips left “Esther Young,” whom he calls his grand daughter and heir to “Lebedie Phillips,” a small amount of money in his will. I think “Lebedie” is a likely mis-transcription of Zebedee. I have found the 1760 birth record for Esther, daughter of Zebedee Phillips. I just can’t find a birth record for Zebedee himself. Thank you so much for your comments. I will pursue the Phillips lead that you are explaining here and of course it may help others. These are among the early problems that I am mostly ignoring as I pull together evidence on my mid-1700’s problems. Keep an eye on my blog if you can; I would so value your comments. I am currently working on a Smith problem that occurs around the time Smithfield was founded around 1730. As you know, Smiths who drifted north of Providence were from several families, and I now suspect more of a Taunton connection on that one, meaning it could be almost anything. I hope your Taunton connection works out, as that will certainly may be easier for you in the long run than thinning the thicket of the Smith’s in the northwest. I agree that Smiths from the north of Providence are from several families, but the deeper you dig, the more you find a very large majority of them are actually all descendents from the original John Smith the Miller, especially when you look at maternal and paternal lines. Further, as uncomfortable as it is to accept (I finally just had to accept it), there is an amazing amount of intermarriage between seven or eight families in the area, and the Miller’s descendants are intermarried into all of them, with their children, grandchildren, etc., marrying spouses who are second and third cousins multiple times over. For instance, my 3rd great grandmother Waite Mowry Smith, wife of George Olney, is her own cousin multiple times over once you count the various degrees and removes. I saw the Smithfield map you posted with the land divided between Olney, Smith, Whipple, AngelI–those very people are all my ancestors and their sons and daughters largely married each other with three or four children from one family marrying sons and daughters of another, etc. I don’t have the source at my fingertips right now, but the Miller’s son John, also called the Miller, had well over a thousand descendants by the fourth generation. When you consider that the population of the area north of Providence was only a few thousand as late as 1740, it becomes clearer that many of the Smiths there are his descendants and are interrelated with the other families of the area. I’ve looked through my records to see if I could find something that might help, but so far no luck. If I do find something, I’ll let you know. I very much appreciate your perspective. As I have been going through the Smithfield records more (in Central Falls), I see more and more Smiths and I agree, it’s very likely that it would be the same Smiths that married into the family over and over again. I’ve been at this long enough that seeing all the intermarriage doesn’t freak me out too much any more. There are a lot of reasons why that probably made perfect sense at the time. I should mention I am very jealous that you are (I presume) a direct descendant of Roger Williams. I still have mysteries to solve but I’m not confident I will ever discover that particular connection. Thoroughly enjoying your blog! 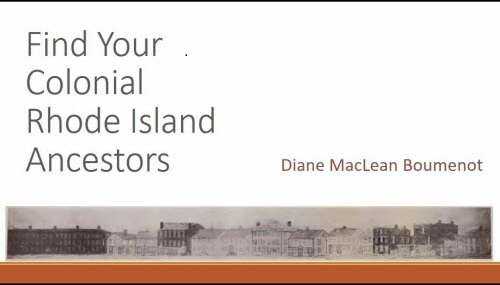 I have the same Phillips line as well as many other Rhode Island lines with ‘questionable authenticity’: Streeter, Mowry, Inmann, Ballou, Whipple, Bartlett, Lapham, Gage, Bucklin, Bowers, etc. Hi Diane, I really enjoy reading your Blog publications and particularly when the name Phillips is involved. We were in Rhode Island last Summer and had the privilege to go to the Providence City Archives as well as the Rhode Island Historical Society. Unfortunately, we didn’t have as much time as required to do extensive research. My major concentration was research on Joseph Phillips as I am a member of the two yDNA groups trying to come to grips with ancestry to Michael Phillips. My paper research goes to Joseph Phillips as a son of Michael Phillips by using Austin’s Genealogical Dictionary. The other members of the yDNA testing groups trace their ancestry thru other children of Michael Phillips. Our yDNA results are entirely different thus the speculation that Joseph Phillips is NOT a son of Michael and Barbara. At the Providence City Archives I met with Nathan Lavigne and Caleb Horton. They were extremely helpful and thru their efforts I was also able to locate the Bond document that you refer to on Elizabeth Phillips. 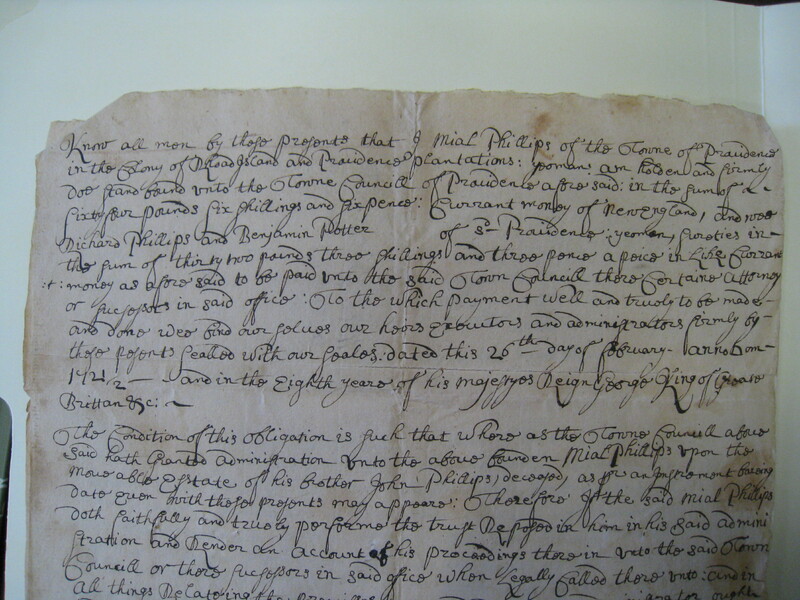 They also located information on the will of Joseph Phillips who died Sept. 3, 1719. By the way, that will is recorded in The Early Records of Providence, Will Book #2, September 12, 1716 to January 7, 1728/29, Transcribed Vol. XVI, printed 1901, the will is on page 98 – Original Book page 67. 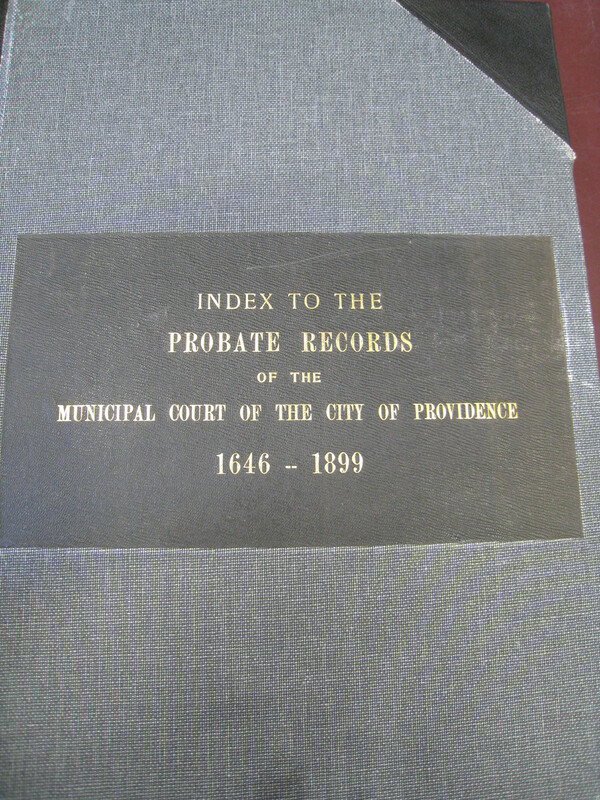 As another sidelight, I located The Early Records of the Town of Providence, Volume XV, 1639 – April 1682. Nos. 01 – 0367. 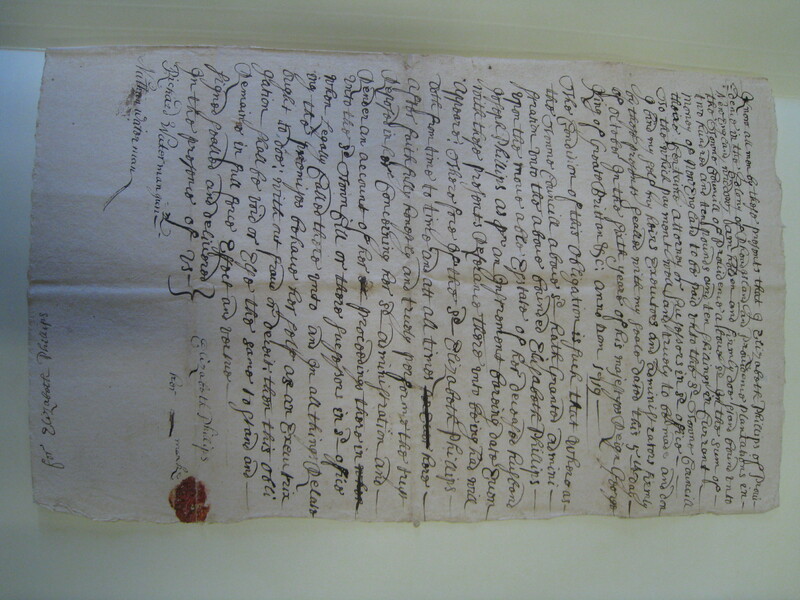 Item  on page 151 records a letter from Francis Brinley to John Whipple, Newport, August 13, 16761. 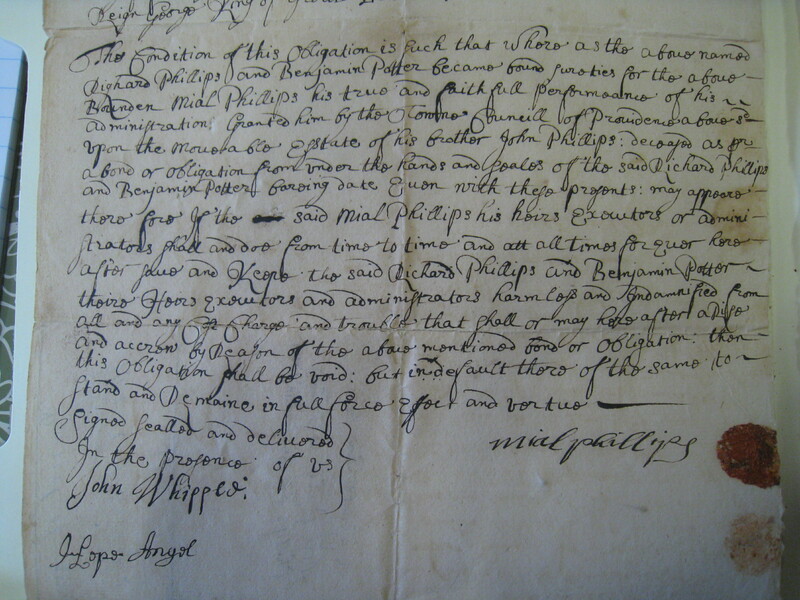 This letter is asking John Whipple to collect a debt of Michael Phillips from Edward Inman, who married Barbara Phillips. 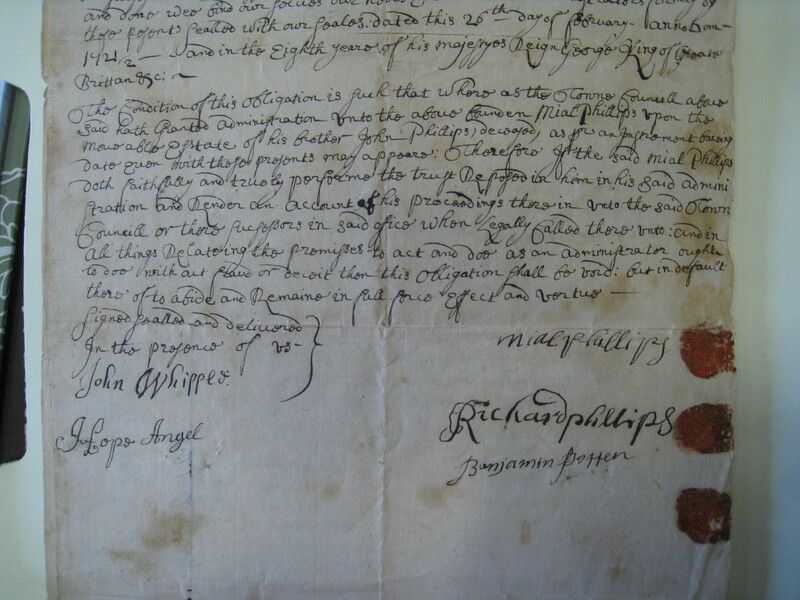 As a result of this letter I have concluded that Michael Phillips died and Barbara remarried Edward Inman sometime prior to August 1676. As to the Bond you located referring to Mial (Michael Phillips) my research reveals that this Michael was a grandson of Michael Phillips and a son of James Phillips. Thank you for those specific references. And thank you for pointing out that the Mial Phillips was a subsequent generation, something I was definitely suspecting but hated to claim without more research. A very knowledgeable friend on Facebook pointed out an article in the National Genealogical Society Quarterly, v. 88 (Dec. 2000): 266-92 by June Riedrich Zublic “Biblical Namesakes: The North Country’s Enoch Phillips and His Tribe.” I am having no luck accessing it through my member login at the NGS website, but I may check it out next time I’m in a large library. Without seeing it, I have no idea how comprehensive it might be. Diane, I am following this information closely since Phillips married into the JONES and I have a quandry with them in couple of spots. Hopes collateral kin can help resolve in the future. Thanks for this information very much. Susi I think these Phillips would make a terrific topic for a journal article or book – a one name study, I guess. If I ever find that that has been done, I will be sure and alert you, and likewise if you discover that, let me know. Richard Waterman was the city clerk. His name appears frequently on many of the Thornton documents that I have seen copies of. I would suspect Nathan was his son or possibly brother who he got to witness her mark.